I love the synergy of the tiny house community. As I was hand writing this post the other day I discovered this Tiny House Listings contribution from Laura Moreland of Tiny House Ontario. However, I did not change my original text in any way based on it. I do encourage you to read her post as well. When you decide to put your story up on the internet there are a few things that you come to expect. Unfortunately, one of those things is negativity. I've written about the "Yum Yucking" phenomenon before but there is an interesting variation on the style. These master yum yuckers appear to believe that there is One Right Way (TM) to build a tiny house. And it seems as if, unknown to most tiny house dwellers, that there is a complex scoring system. It is clearly a competition to see who can tiny house better than anyone else who is tiny housing. Even more curiously, these opinions come from people who are observers of tiny house culture rather than others who have built or are building their own tiny homes. In my experience, tiny house people from all over the world are genuinely excited to see the choices that others have made. We thrive on the diversity and the philosophy of tiny living. Yet, the criticism still lingers on the internet. Lofts are such a bad idea. I need a much better kitchen. This tiny house is way too expensive. You don't live there in the winter so you're doing it wrong. What an ugly modern house. You should only use reclaimed materials. The real lesson here shouldn't be seen in all of the things that aren't perfect about someone else's tiny house but rather the idea that no two houses need to be the same. There is no One-Size-Fit-All tiny house. In fact, that very thought is against everything that the tiny house movement stands for! Tiny homes are intended to be custom. If you want a loft, build one with a loft. First floor bedroom? Check. Gourmet kitchen? Check. Small bath tub? Check. The entire idea is to create a space that works for you as an individual or a family and fits with your specific lifestyle needs. Almost anything you can dream up can be incorporated into a tiny space with a little creative thinking. When members of the tiny house community share their stories online it is not to prove that they can tiny house better than anyone else. They don't want to up their tiny house cred or win an unspoken tiny house competition. They merely want to share their hard work, their philosophy, and their stories. So tell me - what do you want in your tiny home? Not what you think is essential for all tiny homes, but what would make yours work for you. For several weeks now I have noticed the growing sentiment or rather need for definitive tiny house terms. 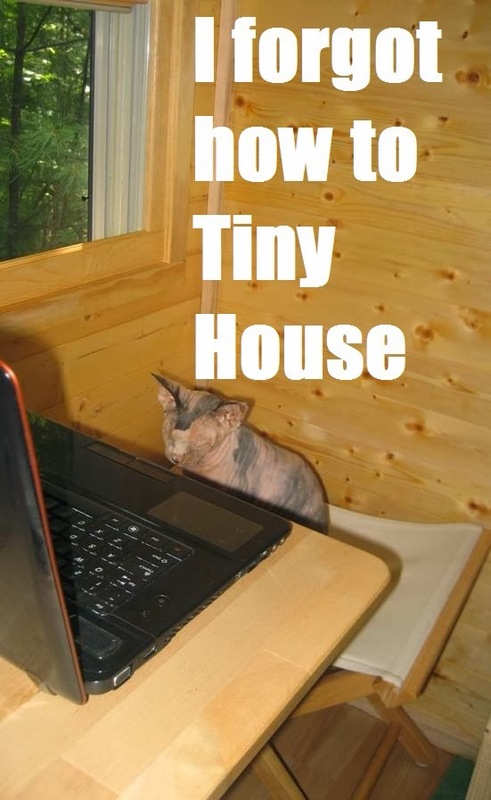 * What is a tiny house? * How big can it be before it isn't a tiny house any longer? * What about a camper? That isn't a tiny house is it? * Is there a plan where I can put 500 sq.ft. on a trailer? The list goes on. Truth is though - as I see it - there is no black/white, right/wrong, left/right in the tiny house world. One of the reasons we became so enamored with the tiny house ethos is the very community it embodied. From the very beginning of our research in late '09 we were greeted by warm individuals who were supportive and encouraging. I can even remember the first time I crossed paths with Tammy Strobel and Logan Smith. They were just amazing to talk to and had such kind words to share with us. Their house is vastly different from ours yet we agree on so many things. The biggest thing we agree on though is that their house fits their needs and our house fits our needs. This sort of community is what is going to keep the tiny house movement going forward. Anything less and we will watch our very trailer foundations crumble, so to speak. We need to work harder and supporting each other and each others ideals of tiny house living. A single floor layout works for my family. A large, gourmet kitchen works for us. In fact, we built our house around those two things. It isn't essential to have those though. No more so than it is essential to have a sawdust toilet or a homemade bench next to your front door. In fact, the ONLY thing essential in tiny homes is that you have an IKEA NORBO table somewhere! I am still in the Dream Stage mostly because of lack of money, and of course, there is a lot to learn. I love pouring over the articles, and cherry picking the ideas I like best. Although I will not be personally be using the loft, I think it would be fun for the Grand Babies, with stairs and rails of course. I need to make this small space bigger, by careful placement, to allow for my wheel chair. Been working on where to put a ramp too. Yes, I want it all...A home with all the bell and whistles, and inexpensive too...I love a good comedy. I love reading your blog and other tiny housers thoughts. I plan on building my own tiny some day, I look for ideas, what I'd like in mine. It's laughable that some folks think there is a "right" way to tiny. I also read a couple minimalists' blogs. I'm trying to weed out my stuff so it will eventually fit in a tiny. Thanks for writing about your journey to tiny. Great piece, Laura! For my tiny house I had to have a big kitchen sink, a wine rack, a porch, a yoga sling, stained glass, numerous windows and as many natural, chemical-free materials as possible. I am moving in this month! I suppose there is no social movement that can't be turned into some form of competition by those people who are hung up on a) status or b) narrow definitions. *I* always thought the point was to live mindfully of your real needs, and that Tiny Houses came into being because lots of folks realized they didn't need all that space they were used to occupying. We have a 24×22 cottage we call "small fly." It's a mansion by tiny house standards I suppose. But is is paid for, well laid out, has some quality features, and has, for the most part, eco-friendly amenities. We needed a bit more than a tiny a wee are larger boned folks with a lot of potential for overnight/week guests. I feel we live small and responsible. We are happy and so our guests. With what we have we are probably more apt to influence than someone living in half the space as we can make a family of 6 very comfortable. Love this. For me I would need a loft with stairs, regular size washer and dryer (I have huge blankets for winters), regular size fridge and a small place so I can have family over. Aren't human beings difficult at times? There is no one right way to do ANYTHING in this world. If there was, it would be the most boring place in the universe!!! Interesting that there's implied "keeping up with the Jonses", even when you trade down. Yeah, it's good to see you (and apparently others) write about the weird competition showing up all around Tiny House blogland. I regularly find it jarring to read comments to the tune of "third-world living", "poor, mentally-ill people would live there", "no way to raise children", etc... I had to stop reading all of my favorite TH blogs for several months to get the bitter taste out. My Tiny Home, Oliver's Nest, will have a roomy loft so I can fit a huge dresser and a book shelf up there. There will be (wonky) stairs instead of a ladder, because I'm a clumsy girl, and don't want to fall on my head on the way to a midnight pee. There will be a large-ish closet below, because I need clothing for farming, riding my horse, riding my scooter, and maybe even for going out to spend time in town. I'm putting in a good sized kitchen to do my cooking, but the food storage will have to be in a root cellar - no room inside. I will have a wood burning stove and hot water tank, but no actual "plumbing". Tub and sink inside with gray water to garden, but sawdust toilet and shower in separate building. Hopeless dream is to have internet, but that's a long shot, as the property is very far off-grid. Laura, I've looked at every single tiny house I can find, loads of floor plans, shed manufacturers, and Pinterest pins until I have Way to many ideas. No one else's house is My house. No one else lives my life. It's been an interesting several months for me to decide what I want the most in my tiny house. I started planning it to be salable, and appeal to others, and then, all of a sudden, I realized that I was building it for my health and happiness, and for absolutely no one else. It's been much more fun since then. French doors, lots of windows, a soaking tub, as few chemical scents as possible, because I have MCS, and beams in the great room for a swing. Yes, a swing. The small, twin-sized loft will be over the middle of the house, so the kitchen and great room both will be open to the roof line. And no propane. None. If you don't like it, don't visit, or waste your time telling me. Don't let the bastards wear you down! I am still in the planning stages, but I am looking at a downstairs bed, with stairs to a loft that is an office/studio area with a barn/gambrel roof so that I can easily sit. I am going to lower the ceiling so that the loft has more space. Ideally I will have a bath of some description as I love soaking when I am sore. I need a full-size fridge. Ideally a dining table as I'd love to have friends over. Everything else I am negotiable on at this stage. Such a timely topic, and I feel that we present our tiny house ideas, floor plans and photos for others because we learned so much from those a little further ahead in their planning or builds. My tiny house will be my first, last and only house, built for me and my needs, not anyone else's. Hooray for *everybody's* awesome tiny house! i really like your stationary loft with all of the windows and the sliding loft is simply awesome, especially that the two can connect. I suppose you could keep ithe sliding one connected with the stationary one or am I reading too much into this? I don't believe you are referring to my home. I would love to see the design you're talking about. I'll bet she was talking about the Nautilus. I just followed a link from that blog over to yours today, too. I just finished reading your book, Laura, and loved it--thanks for giving us all inspiration! That is a really gorgeous design. I wish I could claim it, but it is not my house. I would check with them about the design choices. just found your web site this week. I have enjoyed reading your posts. My daughter interviewed at Warren Wilson - twice I enjoyed both trips down there, but she ended up going to school in VT. We love New England, but Asheville is definitely a cool place!